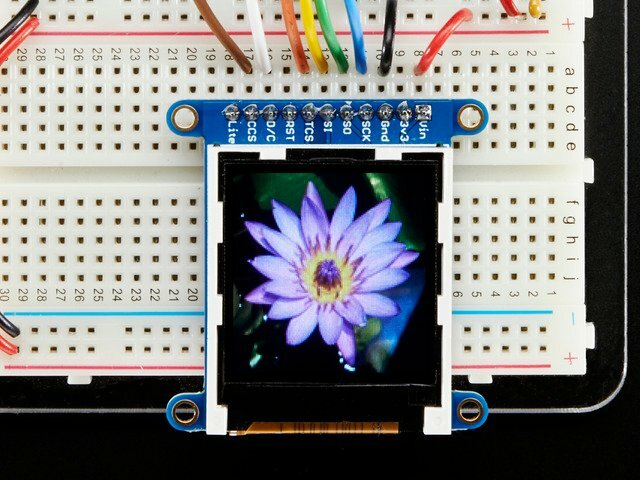 The Snake Eyes Bonnet is a Raspberry Pi accessory for driving two 128x128 pixel OLED or TFT LCD displays, and also provides four analog inputs for sensors. It's perfect for making cosplay masks, props, spooky sculptures for halloween, animatronics, robots...anything where you want to add a pair of animated eyes! It’s a follow-on of sorts to another project: Electronic Animated Eyes Using Teensy 3.2. The Teensy 3.2 is a very capable microcontroller, and the code for that project squeezed every bit of space and performance from it. I had been experimenting with the Raspberry Pi as an alternative…while it’s still very experimental, why not make that work available to others? Hardware-accelerated 3D graphics (OpenGL), including antialiasing. A faster CPU, ample RAM and dual SPI buses could yield faster frame rates. Standard graphics formats like JPEG, PNG and SVG can be decoded on the fly; no preprocessing step. The eye rendering code is written in a high-level language — Python — making it easier to customize. Raspberry Pi takes time to boot an operating system off an SD card, whereas Teensy is instant-on with all code in flash memory, . The Pi also requires an explicit shutoff procedure (usually). The Raspberry Pi is not as suitable for wearable applications…it’s larger, uses more power, and the SD card makes it less rugged. This is a somewhat technical and not-inexpensive project. Please read through everything first before commiting. If it seems daunting, the original Teensy Eyes are more “Arduino-like” to build and customize, or other guides like Animating Multiple LED Backpacks provide a more approachable introduction to code and electronics with less of an investment. A Raspberry Pi 3 or Pi 2 is highly recommended. The code will run on a Pi Zero or other single-core Raspberry Pi boards, but performance lags greatly. Don't forget, our Bonnet only comes with the PCB that lets you connect two displays. The two displays are not included and must be purchased separately! Some situations don’t require the screens or Bonnet at all! See the “Using Just the Software” page if planning a single, non-interactive HDMI eye. The code for this project works only with our 128x128 pixel OLED and TFT displays and 240x240 pixel IPS TFT displays. Other displays such as our 160x128 TFT or various PiTFT displays ARE NOT SUPPORTED AT ALL, period, not even sorta. Any recent Raspberry Pi board with the 40-pin GPIO header should work. The very earliest Pi boards — Model A and B, with the 26-pin GPIO header — are not compatible. A Raspberry Pi 3 or Pi 2 is highly recommended. The code will run on a Pi Zero or other single-core Raspberry Pi boards, but performance lags greatly. We’re gradually working to improve performance on these boards. One display or two? You don’t have to connect two displays…some of the most creative variants of the “Teensy eyes” had only a single eye. OLED, TFT LCD or IPS TFT displays? OLEDs have a wide viewing angle and excellent contrast and color saturation, but they’re somewhat pricey. TFTs make good economy displays if you’re okay with the slightly washed-out appearance. IPS TFT displays are in-between in cost and super sharp! 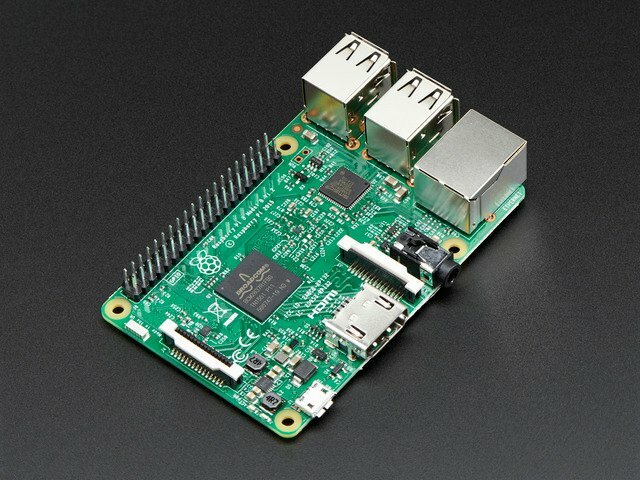 What model of Raspberry Pi to drive it? The latest multi-core boards (like the Pi 3) have ample performance for smooth animation…but their size and power draw might make them best for stationary displays, like maybe a Halloween window prop. Costume and portable installations may fare better with the diminutive Pi Zero, though the animation will be much less smooth. Will the animation be running autonomously, or do you plan to control the eyes with a joystick and buttons? Will the pupils react to light? These require additional components. There’s one more factor to consider: how do you want everything connected? Think about your intended installation. Is it temporary or permanent? Is space at a premium or do you have ample working room? These can influence your choice of wiring and connectors. If using OLED display(s): use the “upper” rows (with the word “OLED” between them). There are 11 pins on the OLED breakout boards, which map directly to the 11 pins on the bonnet board. Make absolutely certain the wires are in the same order. “SI” and “G” on the display board should go to “SI” and “G” on the bonnet, and each pin in-between…no wires should cross. If using TFT or IPS display(s): use the “lower” rows (with the word “TFT” between them). There are 11 pins on the TFT breakout boards, which map directly to the 11 pins on the bonnet board. Make absolutely certain the wires are in the same order. “Vin” and “Lite” on the display board should go to “Vin” and “Lite” on the bonnet, and each pin in-between…no wires should cross. There’s a common trope in science fiction stories: that there is no “up” or “down” in space. Wiring these displays is a little like that…it doesn’t matter if the wires or headers come out the front or back of the display breakout board, use straight or right-angle pins…as long as those wires get from the display to the bonnet in the same positions and order, everything’s good. Here’s a probable layout for a non-portable installation. Straight header pins have been soldered to the bonnet board and the displays, projecting “up” and “back,” respectively. Two 11-pin female-to-female ribbon cables then join everything. This might be easiest to assemble (and disassemble), and the straight header pins on the displays make them easy to re-use in breadboard projects later. …but that’s not the only option. This TFT display has right-angle hader pins on the front of the board (front, back, doesn’t matter as long as the wires connect in the same order). This makes it very slim, but also a fair bit taller. And this OLED has an 11-pin ribbon cable directly soldered to the board, no header pins at all. Again…front or back, ribbon could go straight out or can double back across the board…it all depends on your construction and space needs, as long as the pin order is followed. This is the most space-efficient, but requires patience and ace soldering skills, and isn’t easily re-used in other projects. 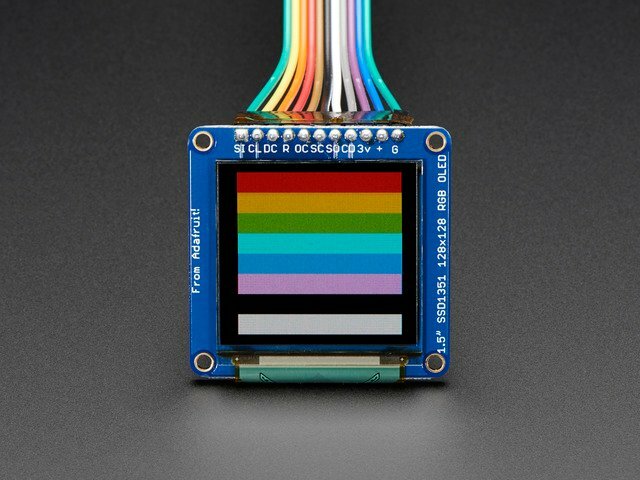 If using “rainbow” ribbon cables: these have 10 colors, while the displays use 11 wires…this means the cables will have the same color wire along both edges. Therefore, DO NOT rely on a visual mnemonic like “black wire is ground” or “red wire is Vin,” because your cable may have two black wires, or two reds, or two anything. Instead, make sure to manually follow the first wire all the way from the bonnet to the display, make sure they line up right, then install the remaining wires in order. If you’re really economizing for space, here’s a secret: only 7 wires are really needed…it’s just easier and less error-prone to solder a header at each end and plug all 11 wires straight through. If using the OLED display, the SC, SD, CD and 3V pins can optionally be skipped. If using TFT, the 3v3 SO, CCS and Lite pins can be skipped. Make certain the exact same pins are skipped at the bonnet end, don’t mix them up! To ensure a clean signal from bonnet to displays, aim to keep your wiring short and tidy. Electrical interference can lead to animation glitches…we’ll explain on the next page how to dial that back if needed. It’s possible to use long ribbon cables (even a couple meters), but it invites problems with interference or signal reliability. For optional features like joysticks, light sensors, blink and halt buttons, see the “Customizing the Hardware” page. When finished soldering, you can peel the clear plastic covering off the displays. It’s meant to protect them in shipping and during soldering. But unlike the screen protector on a phone or tablet, it’s not optically pure and makes the display look cloudy. Start by downloading the current version of the Raspbian Lite operating system from the Raspberry Pi web site, then write this to a 2GB or larger micro SD card using Etcher or similar software. Use latest Raspbian “Lite” for this project. Full-featured Raspbian won't work, and older versions won't work. If your target system is a Raspberry Pi Zero, you may find the setup process easier with a spare full-size Raspberry Pi board such as a Pi 3, Pi 2 or Model B+, then move the card over to the Pi Zero when finished. If this is not an option, see this guide for steps to make the Pi Zero act as a “USB Ethernet gadget,” and also create a file called “ssh” in the boot volume to enable ssh login. 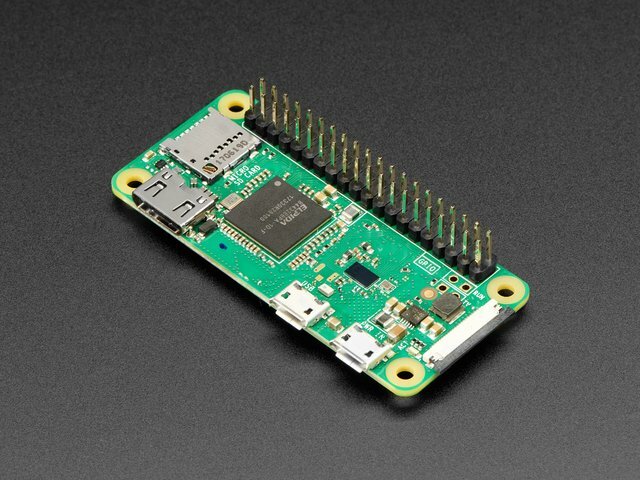 For the Pi Zero, you can share a host computer’s network over USB using the “Ethernet Gadget” directions in this guide. Under “Internationalisation Options,” select “Change Keyboard Layout.” If you’re getting unexpected characters from the keyboard, this is usually why. Under “Advanced Options,” select “SSH” and enable it. This lets you log into the system using a terminal program across the network, so you won’t need the keyboard and monitor in the future. Next step is to get the Pi on the network. If using wired Ethernet, it’s usually a simple matter of plugging it in. For WiFi, this tutorial can offer some guidance…specifically the “Setting Up WiFi on the Command Line” page. You may need to reboot once or twice during the above setup procedures; this is normal. Do not continue until the Pi is networked. You can test with “ping adafruit.com” or similar. Reboot when prompted by the software installer. When the system restarts, after a minute or so, you should see some activity on the display(s). IT’S NORMAL THAT THE EYES MAY EXHIBIT “GLITCHES” ON THE FIRST TRY. We’ll fine-tune some parameters to get them working right. If everything seems to be working well, you can skip ahead to the next page and ignore the steps below. The displays will stop updating. This is normal. The first argument (-o, -t or -i) sets the display type in use; OLED, TFT or IPS, respectively. Second argument (-b) sets the maximum bitrate for the displays. The higher the bitrate, the smoother the animation…but…there’s a limit to how fast this can go, and it can vary with wire lengths, connections, environment (such as interference from other nearby devices) and even slight manufacturing variances from one display to the next. For OLED displays, the default bitrate is 10000000 (10 MHz). For TFT displays, default is 12000000 (12 MHz). IPS uses 96000000 (96 MHz) by default. But if there’s trouble, we have to dial these back. Try a lower value, like the 8 MHz or 10 MHz examples above. Watch the output for a minute…does it seem to have stabilized now? If only one of the two displays glitches, you’ll still need to work the speed down until both run reliably. After a minute or so the eyes should come up again, glitch-free this time. If not, repeat these steps again, trying a lower bitrate until you find a setting that works reliably. Another way to reduce glitches is to solder ribbon cables directly between the bonnet and displays, with no headers or plugs in-between; every intermediary part is an opportunity for noise or connection problems. Consider this if you plan on permanent installation. At the bottom-right of the bonnet are a few extra connection points for 5 Volts, 3.3 Volts and ground, if you have a circuit that needs them. These are OK for small loads like ICs or a few LEDs, but not for big things like servos, which will need their own power source. To the left are four analog input pins (along with four more 3.3V and ground points). You can use these to interface analog circuits such as a joystick to steer the eyes, photocell to make the pupils react to light, or perhaps to monitor battery voltage (use a voltage divider in this case, since the analog input must be 0 to 3.3 Volts). Woops, we swapped SDA and SCL on the silkscreen - apologies! SCL is the left-most pin, and SDA is the pin to the right of it! TX and RX are available as GPIO14 and 15 if the serial console is disabled with raspi-config. SPI0 (SPI bus used for the right eye) uses GPIO8-11 (CE0, MISO, MOSI and SCLK, respectively). Steer clear! SPI1 (second SPI bus used for left eye) uses GPIO16 (CE2) and 19-21 (MISO, MOSI, SCLK). Avoid! Also, I2S audio devices can’t be used because the pins overlap. GPIO5 and 6 connect to the DC and RESET pins of both displays, so these too should be avoided unless you have some special situation. Any analog controls that are added should include connections to the 3.3V and GND pins. Do not use the 5V pins or there will be…trouble. XOUT and YOUT from a joystick can connect to analog pins A0 and A1. The eyes move autonomously by default — settings in the code enable the joystick instead. If you need to mount the joystick in a different orientation, there are also settings to invert each axis. Swap the X and Y pins in the code to use the joystick sideways. This thumb stick has a click feature, which could be used to control eye blinks if desired. The smaller “mini” stick doesn’t have this, but is extra tiny for working into a costume or puppet. To have the pupils contract or expand in response to light, connect a photocell and 10K resistor in series. The midpoint connects to analog pin A2. Analog input for the pupils (either photocell or the dial below) are enabled in the code by default. You can comment out IRIS_PIN in the code to have this move autonomously. For manual control of pupil dilation (instead of responding to light) a 10K potentiometer can be used. 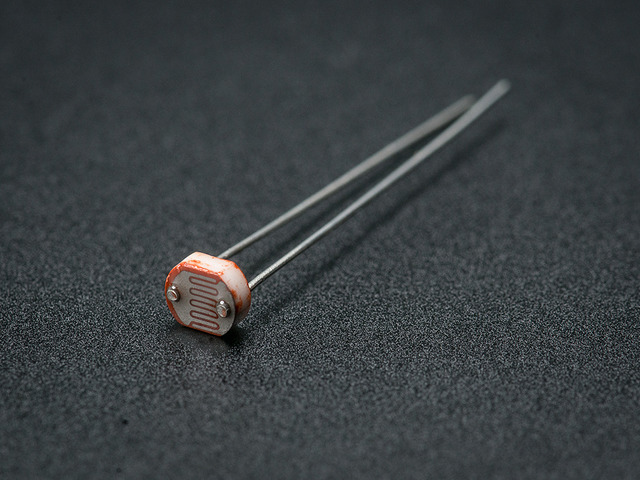 The center leg connects to analog pin A2 (same input as the photocell, just substituting a different analog control). The eyes normally blink autonomously, but you can also add one or more buttons to make them blink (or even wink individually) on command. GPIO Pin 22 is the left eye wink. GPIO Pin 23 blinks both eyes. GPIO Pin 24 winks the right eye. 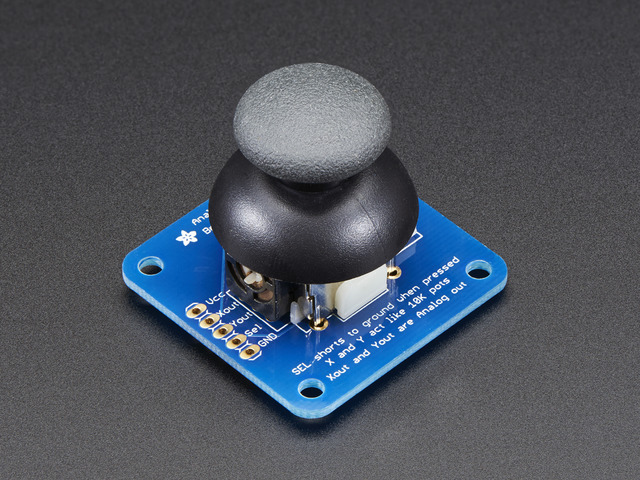 If using our analog joystick breakout board, that stick includes a clicky button when you press down on it (on the SEL pin). This can optionally be used for manual blink control, or you can use a separate button for this (I find the joystick button a bit hamfisted). Adjustments to the code must be made to use any of the above features. You’ll find the code in /boot/Pi_Eyes/eyes.py. It’s located in /boot to simplify “offline” editing on another system…if editing on the same Pi where it runs, you may need to edit as root (e.g. “sudo nano /boot/Pi_Eyes/eyes.py”). After making changes, you could hunt down the background Python process that was run at startup, kill and restart…but it’s usually easiest just to reboot. PUPIL_MAX       = 1.0   # Upper "
For example, to enable analog joystick input and a photocell, set JOYSTICK_X_IN, JOYSTICK_Y_IN and/or PUPIL_IN to analog channel numbers (0 to 3). If the response from the stick or sensor is backwards, set JOYSTICK_X_FLIP, JOYSTICK_Y_FLIP and/or PUPIL_IN_FLIP to “True” as needed. The installer script places the code and data in the directory /boot/Pi_Eyes. If you’re not familiar with Linux text editors and so forth, you can move the SD card over to a regular Windows or Mac system, where the “boot” partition appears as a drive and you can edit these files with your text editor of choice. If using TFT or OLED screens on a Snake Eyes Bonnet board, the Python script of interest is eyes.py. If using HDMI output (with or without the bonnet), look for cyclops.py (so named because it only renders one eye). After making changes to the code, rather than tracking down and killing processes, it’s often easier just to reboot the Pi. After a minute or so, the revised code will run on startup. Most relevant here are AUTOBLINK and TRACKING. If AUTOBLINK is changed to False, the eyes will stop their automatic blinking (responding only to button presses, if you have something like that wired up). If TRACKING is changed to False, the eyelids will no longer follow the pupils as they move around (this is an interesting thing that real eyes actually do, but sometimes you want a continuous wide-eyed stare). The other settings above are mostly related to hardware stuff. Most common graphics formats (JPG, GIF, PNG — the latter with or without transparency) are supported. The images are square to make the OpenGL library happy. The graphics are stored flat and unrolled, like a map projection. The horizontal (X) axis works like the longitude, or angle around the eye, while the vertical (Y) axis is the latitude. The iris (file iris.jpg) is what we think of as the “color” of the eye and is most often what you’ll want to edit. Sometimes you just need to edit the hue & saturation in a program like Photoshop, or you can make something totally custom if you’re after a particular look. The sclera (file sclera.png) is the “white” of the eye…which really isn’t that white at all. There’s veins and blotches and gross stuff! This file is a transparent PNG to simulate the transition where the sclera meets the lens…it’s not an abrupt transition, there’s a slight “fuzziness” to it. When editing, try to preserve that transparency (and note the couple of transparent rows at the bottom, necessary because of the way OpenGL interpolates these images). InkScape and Adobe Illustrator (among others) can both load and save SVG files. But…editing / substituting this file is fairly tricky, as the names of individual paths are used in the Python code. If your graphics editor of choice does not maintain these element names exactly when changing or saving the file, the Python code will fail to run. The largest blue circle there, which extends to the edges of the document, can mostly be ignored…it’s there for reference and represents the outer bounds of the eye ball (which can’t be changed). The iris path (which needs to remain a circle, though you can change its size) determines the size of the outer edge of the iris relative to the whole eye. pupilMin and pupilMax are the size and shape of the pupil in its most contracted and most dilated positions, as it responds to light. This doesn’t need to be a circle! Have a look at dragon-eye.svg for example. Two additional blue circles — scleraFront and scleraBack — are used in determining the “sweep” of the white of the eye. Notice it overlaps the outer edge of the iris slightly, and is open at the back (we have no need for the back of the eye, so it’s not modeled or rendered). Red paths are used for animating the eyelids. upperLidOpen and upperLidClosed are the shape of the upper eyelid in its fully-open and fully-closed positions. lowerLidOpen and lowerLidClosed are the same for the lower eyelid. upperLidEdge and lowerLidEdge are used by the software to generate the other edge of the eyelid mesh geometry, which is really a 2D polygon that occludes the eye behind it. Our Python code generates OpenGL animation that goes to the Pi’s normal HDMI video framebuffer, whether or not there’s actually an HDMI display attached. A separate program — fbx2 — continuously copies two sections of the framebuffer to the TFT or OLED displays attached to the Snake Eyes Bonnet. The fbx2 program performs repeated screen captures, scaling it by 50% (providing a smooth 2:1 downsampling in the process) and then copying two squares centered on these regions to the connected SPI screens. For OLED or TFT, the screens are 128x128 pixels, so the sections of the screen copied are 256x256 pixels, and the eyes have a radius of 128 pixels. IPS screens are 240x240 pixels, so the copied sections are 480x480 pixels and the eyes have a radius of 240 pixels. There’s a lot of unused blank space around the eyes; this is normal and by design. If developing your own code, this allows you to put debugging or status information in the margins of the HDMI display, but not have it copied to the SPI screens. Also, the eyelids are rendered by dynamically generating 2D meshes, and these need to be a little larger than the eyes to fully block things out. If the eyes were right up against each other, these would overlap. Using HDMI video out doesn’t require the Bonnet board, unless you want analog inputs for a joystick control or a light sensor. Follow the steps on the “Software Installation” page — start with Raspbian Lite, do some first-time configuration and get the system on your network. Download and run the pi-eyes.sh installer script as explained there. When prompted for a screen type, select HDMI. Install GPIO-halt if you want a single-button shutdown option. This requires wiring up a button between one of the GPIO header pins and ground. Install ADC support only if you have the Snake Eyes Bonnet and want analog inputs for a joystick or light sensor. Install USB Ethernet gadget support only if using a Raspberry Pi Zero (or Zero W) and want a direct USB connection from your main computer. It’s explained a bit in this guide. After rebooting (about 30 seconds to one minute), you’ll be greeted with a single large eye centered on the screen. In order to work with the WorldEye display (or other HDMI devices), the code and graphics for this version are slightly different. 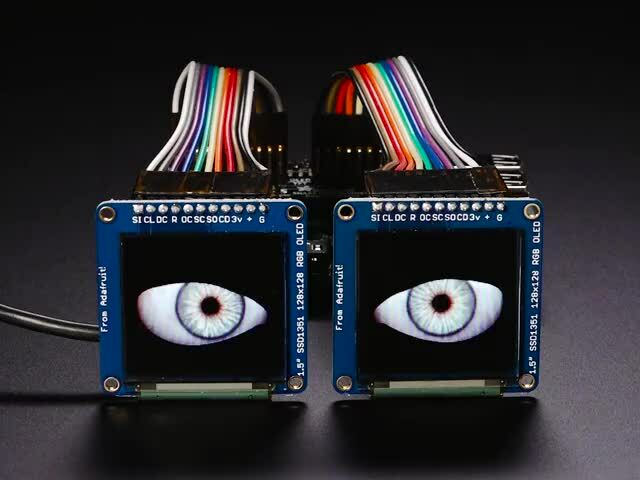 The TFT/OLED code (eyes.py), designed for two separate physically-wired screens, provides a distinct shape for the left and right eyes to approximate the caruncle (the inner corner of the eyes). The HDMI code (cyclops.py) generates a single symmetrical eye (no carnucle), so it can be fed to an HDMI splitter and not look lopsided on two screens. Change the first two numbers — 640 and 480 — to the desired resolution. Save the changes and then reboot. This guide was first published on Jan 11, 2017. It was last updated on Jan 11, 2017.